There were 14,136 casino gaming terminals located in casinos and Racing Entertainment Centres (RECs) across Alberta as of March 31, 2016. Alberta has the highest concentration of table games in Canada, and the second highest concentration of electronic gaming machines (both slots and VLTs). In 2016, net revenue to the Alberta Lottery Fund in Alberta’s gaming industry was almost $1.4 Billion (including casino gaming, VLTs, and electronic bingo). ACCO members represented $852M of this or 61% of total net revenue. Alberta casinos contribute $291 per Albertan, this is the highest contribution from casinos compared with other Canadian provinces with private operators. 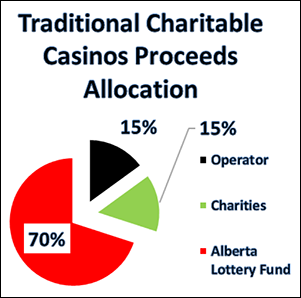 Alberta Charitable Casino Operators are the lowest cost and most efficient operators in Canada. Participating charities share an equal share of electronic gaming machine proceeds with casino operators, with the bulk going to the Province of Alberta via the Alberta Lottery Fund. In 2016 there were 3123 charities registered for gaming operations representing approximately $258M in proceeds.